It’s wet and wild whilst I write this blog. Not dissimilar to yesterday when ex-storm Jonas, which brought parts of the U.S. 2-3 feet of snow, rattled across the UK. This is a sure sign that the Jet Stream is back in charge of our weather, depressing news for proper cold- and snow-lovers. The next few days sees an up-and-down trend in temperatures across the region as we swing from one side of the Jet Stream to the other. After a mostly wet, windy and mild Wednesday we sit on the cold side of the Jet Stream on Thursday. A cold start with a rural frost; so perhaps some deicing before work for some. Feeling much colder with sunny spells but cloud increases during the day with some rain or showers expected into the afternoon, some heavy. Winds will again increase; gale-force gusts overnight. Cold during daylight hours but temperatures rising again into the evening. Max 8°C. Again it is milder into Friday but it will not feel so with very windy conditions. Gusts to 55mph in exposed places is likely, especially so during the morning. Showers at times on the westerly wind and more general rain overnight. Max 12°C. I did say a few days ago that we won’t see any more snow in January. Saturday will be cold enough for some wintry showers so we could see some hail and possibly some sleet or snow showers in areas above 350M. Not exactly a major snow-event but a reminder that it’s winter and enough for the Met Office to issue a warning for further north. Max 5°C. Overnight into Sunday and it looks like rain will return from the south-west and with it milder temperatures once more. Certainly weather that can’t make its mind up. Max 11°C. Looking ahead and next week could start with more gales on Monday. After that, sunshine and showers with tempertures back down into single-figures. I’m still going for a chance of some decent cold and bitter temperatures from mid-February. As always, no-one knows and this is just my hunch. Photos/Data: http://www.ukweatherforecast.co.uk, http://www.metoffice.gov.uk and netweather.tv. So at last, it feels like winter; well January at least. To me it’s not winter until we see some snow and hard frosts. So, snow, where is it, and can we expect some? A tough question to answer as we hover close to “cold-enough-to-snow-temperatures”. It has turned colder this week and some of the tops have seen a covering of snow, albeit slushy and temporary but most of our showers have continued as rain. As promised the Jet Stream slipped south allowing colder air to feed in from the north. This will remain the case for another 5-7 days. It turns colder at the back end of this week, so the chances of seeing some snow increases and the areas it could fall in, may include lower areas, rather than just the locations above 300M. Wednesday night sees showery rain come in from the west and as this bumps into the cold air we could see some snow especially above 300M. Therefore, Thursday will start with some rain, sleet and snow. As this moves away colder air digs in and any rain could turn to snow for a time before brighter skies and the odd wintry shower feed in. Risk of snow showers overnight, even to lower levels. Max 4°C. Friday will be a day of wintry showers and bright spells. Some of these showers will be of hail and snow. Again most of any snow will be for higher ground but not exclusively. Feeling raw in a bitter wind. In fact, Thursday and Friday will have a sub-zero wind-chill. Frosty and icy night ahead as showers fade. Max 4°C. The weekend promises to be a largely dry affair as high pressure builds over the UK. This means plenty of sunshine but very cold nights with a risk of fog and widespread sharp frosts. Saturday and Sunday look very similar. Cold frosty mornings and nights with sunny spells during the day. There could be some freezing fog slow to clear and where it lingers on, the daytime maximum temperature will not rise above zero. Staying cold throughout with night-time temperatures even as low as -8°C especially in rural spots. Daytime Maxes 3°C. Looking ahead and it will remain cold to start next week but it then looks likely that milder air will return from the southwest bringing rain which might be preceded by snow for a time. Perhaps temperatures will return to double-figures? It is tricky to pinpoint snowfalls, especially when temperatures are 50/50 for snow to occur. My advice would be to keep a watch on my tweets this week for the very latest on the snow-risk. Happy New Year and all the best for 2016! Hopefully an interesting weather year ahead. I’m only asking for heavy snow, storms and a heatwave; shouldn’t be a problem! After recent flooding across different parts of the UK, the weather pattern is going to change. As mentioned in the last blog, the majority of the Jet Stream is shifting south. This will allow colder air to filter down from the north and northwest. This will be more noticable into next week. You probably heard heavy rain overnight on Wednesday and this will be slow to clear on Thursday. After a wet morning it will gradually turn drier and a much better afternoon lies ahead with sunny spells. Breezy with a chance of isolated showers later. Max 7°C. Still unsettled into Friday. Any dry start will be replaced by a band of showery rain moving from west to east. Drier into the evening and with clear spells overnight, a slight frost and some ice to watch out for. A cold day. Max 6°C. Saturday starts chilly and mainly dry. Cloud will soon thicken from the southwest with rain expected to spread across all parts leading to a wet day. Becoming breezy and feeling cold. Max 6°C. Turning a little colder as we go through Sunday. Some rain around which might be a bit sleety over the hills. Drier later. A cold night ahead with a touch of frost possible. Max 5°C. 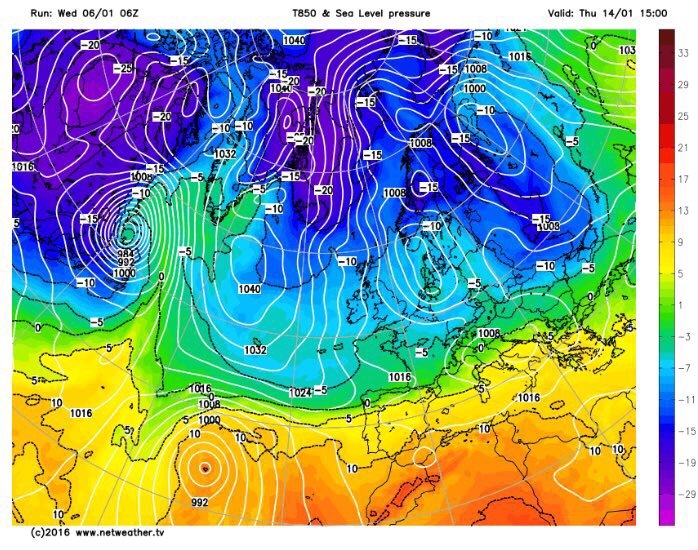 Looking ahead into next week and it’s looking more like it, for the cold-lovers out there, especially from midweek. Overnight frosts widespread and although it will be much drier than recent weeks we could start to see some wintry showers, so hail, sleet and some snow could be on the cards. Northerly airflow brings cold air down across the UK.